Located on the on the West Coast of Malaysia, Sekinchan is a small town in Sabak Bernam, Selangor. It is a beach side fishing village that is famous for their breathtakingly beautiful paddy fields. It used to be quiet, but it has garnered attention from all parts of Malaysia in these past few years. Despite being one of the major rice producers in Malaysia as well as a supplier of fresh seafood, it is also an amazing destination to visit and hang out for a one-day trip! It is about a 100km drive from Kuala Lumpur and it takes around an hour and 30 minutes to get there, via the Lebuhraya KL-Kuala Selangor. You can also take the bus from Puduraya Bus Terminal (counter SPT Sabak Bernam-Kuala Lumpur). Prepare sunglasses, sunblock, hats and lots of water – because Sekinchan is HOT! The best times to go to Sekinchan is during March/April as well as September/October! It is when it’s pre-harvest season, so there are just carpets of lush green everywhere! During other times, the paddy fields are filled with gold or yellow. In December, it’s harvest season! Harvest trucks can be seen in the paddy fields. 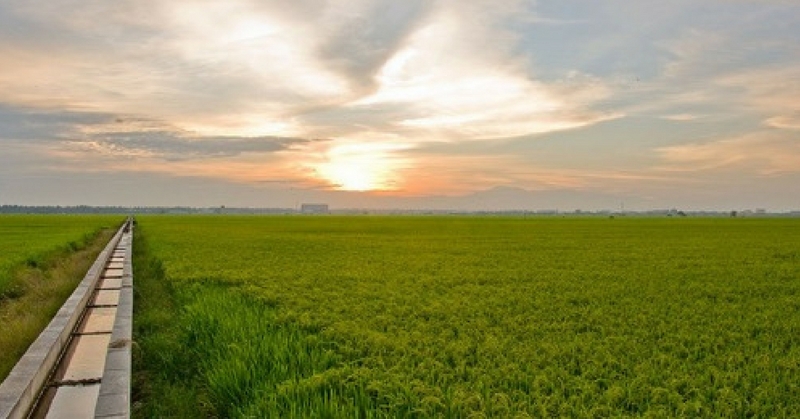 Head to Jalan Tali Air and visit the beautiful paddy fields that covers thousands of acres. Run through it and take loads of pictures! You can even go cycling along the paddy fields. Swiflets, white birds and dragonflies are among the few animals that call this place home. And during the night and since there is not much light pollution, stargazing can be done! Visitors get to understand the complete life cycle of rice planting and view exhibits of machinery and tools used to process rice back in the day. The admission fee is RM5 and you receive a small packet of rice as a token of appreciation. They also sell snacks and ice cream popsicle sticks of various flavors – perfect for the kids! Enjoy the sunset at this beautiful place but do be careful when the tide is out during the daytime! Coconut water and ice cream can be purchased in the area as well. Not only that, raw oysters can be enjoyed too! Of course, you must eat the seafood found in this fishing village! Some of the restaurants include Jiann Chyi Seafood Restaurant 建旗海鮮飯店, Hao Xiang Chi Seafood Restaurant, Restaurant Bagan Sekinchan, Guan Seng Long Restaurant, Wan Lau Seafood Restaurant and more! Get lucky red cloth from the temple with a small donation, write down your wishes and your name, then throw it up to the wishing tree! The ends of the strip are tied to coins and thrown up onto the branches. It’s a speciality cake and biscuit store in Sekinchan and they offer a variety of traditional biscuits like pineapple tart, kuih bangkit, kuit kapit and more! It’s called Ah Ma because of the grandmother’s recipes used for the biscuits, giving them a homey taste that brings back memories! A unique homestay that is designed from freight containers that overlook the beautiful paddy fields of Sekinchan! There is also a café for you to chill at, TV and free WIFI. Breathe in the fresh air complimented by an amazing view of lush greenery and great hospitality. Located in the town, it’s a boutique hotel with tastefully designed rooms. There’s also a beautiful rooftop with a great view! There a bunch of homestays provided by the locals there that are listed on sites such as www.airbnb.com, www.booking.com and more! If you’re ever wondering where to go for your next trip, let Sekinchan be your next stop.